Thermal Labels, 4" x 3" Thermal transfer polyester label. 2000 labels/roll, 4 roll case. Thermal Labels, 4" x 6" Direct thermal paper label. 1000 labels/roll, 4 roll case. Also available as a roll (Part# 53S002016-R). Thermal Labels, 4" x 3" Thermal transfer paper label. 2000 labels/roll, single roll. Also available as a case (Part# 53S001013). Thermal Labels, 4" x 3" Thermal transfer paper label. 2000 labels/roll, 4 roll case. Thermal Labels, 4" x 6" Thermal transfer polyester label. 1000 labels/roll, single roll. Also available as a case (Part# 53S005316). Thermal Labels, 4" x 6" Thermal transfer polyester label. 1000 labels/roll, 4 roll case. Also available as a roll (Part# 53S005316-R). Thermal Labels, 2" x 1" Thermal transfer polypropylene label. 5800 labels/roll, 8 roll case. Thermal Labels, 3" x 1" Thermal transfer polypropylene label. 5800 labels/roll, 4 roll case. Thermal Labels, 4" x 4" Direct thermal paper label. 1600 labels/roll, 4 roll case. Thermal Labels, 4" x 3" Direct thermal paper label. 2000 labels/roll, single roll. Also available as a case (Part# 53S002013). Thermal Labels, 4" x 3" Direct thermal paper label. 2000 labels/roll, 4 roll case. Also available as a roll (Part# 53S002013-R). Thermal Labels, 3.5" x 1" Direct thermal paper label. 5800 labels/roll, single roll. Thermal Labels, 3.5" x 1" Direct thermal paper label. 5800 labels/roll, 4 roll case. Thermal Labels, 3" x 1" Direct thermal paper label. 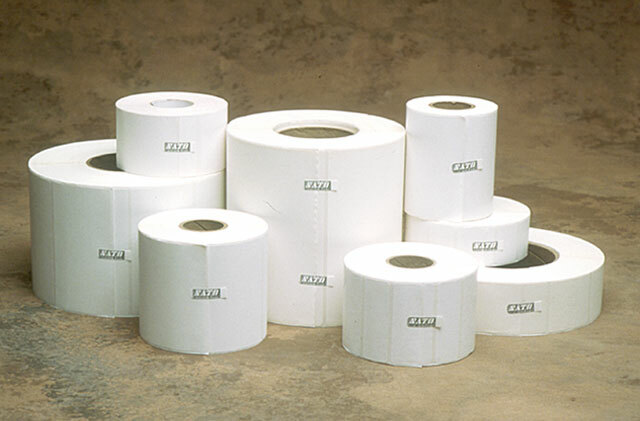 5800 labels/roll, single roll.